Make her feel like a princess with this 9ct white gold sparkling diamond cluster ring featuring dazzling round cut diamonds and diamond-set shoulders, with the elegant tiara emblem diamond-set side detailing. 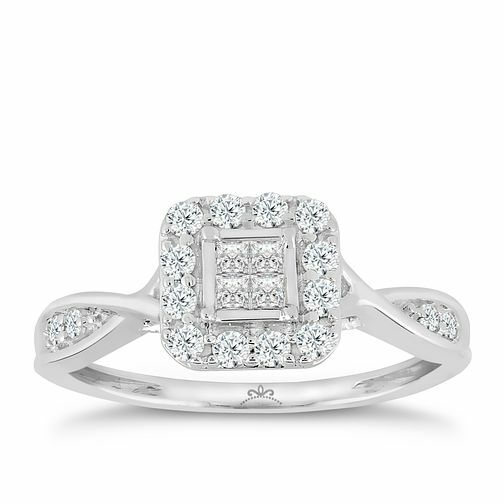 This stunning ring is set with 2/5 carat worth of diamonds. 9ct White Gold 2/5ct Diamond Princessa Ring is rated 4.9 out of 5 by 16. Rated 5 out of 5 by Anonymous from Beyond beautiful My partner proposed this Christmas wit this ring and it is amazing. It really is better in the flesh. The pictures don't do it justice. Very sparkly. I love it,would definitely recommend. Very pleased and well worth the money.